Our kitchen floors have to stand up to a lot—footsteps day after day, the scrape of chair legs, and probably the occasional spill. That means they need to be sturdy and resilient. But floors also cover a huge, highly visible area in your house, so it’s important to find a style you really love. Tile is a great choice for many reasons. If you want to protect the environment, you’ll find countless reclaimed and recyclable options. Plus, tiles are easy to clean with non-toxic chemicals, like water and baking soda. Old, reclaimed stone has an authentic feel that even well-made synthetic materials can’t quite replicate. Limestone will give you a lovely earthy appearance, but it’s a little prone to scratches, so if limestone is going on the floor, I recommend textured tiles. They won’t show damage as much. Since reclaimed materials can be a little trickier to get ahold of, consider using a variety of tile widths and lengths, to create a beautiful mosaic. 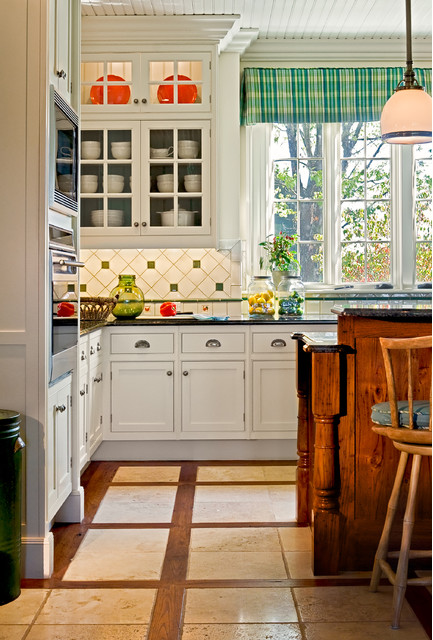 The floors in this kitchen are from Ancient Surfaces, according to its designers. If it’s durability you’re after, look no further than slate. Slate is dense, naturally textured, and perfect for busy kitchens. Like limestone, slate is a natural stone, though it usually comes in dark or mixed colors. 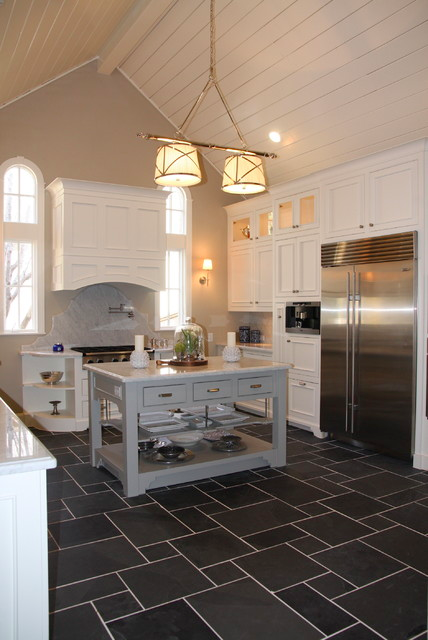 Many slate-lovers choose large square tiles, like the ones in this kitchen. Terra cotta (“baked earth” in Italian) is a type of clay-based ceramic that’s been used in building and art for thousands of years. Nowadays, the term also refers to the natural red/orange color of the material. To get an old world Mediterranean flair, tiles that mimic terra cotta color are a gorgeous choice. 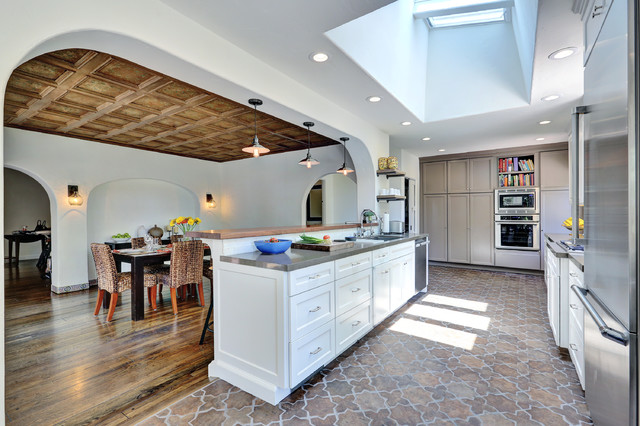 The floor in this next kitchen adds some spice to an otherwise simple space. Having trouble picking just one style? You don’t have to restrict yourself to a single color. When done right, a mix of tile dimensions and colors makes just enough of a statement without being over-dramatic. The style will look more streamlined if you stick with a simple palette of one accent color and one or two neutral colors. 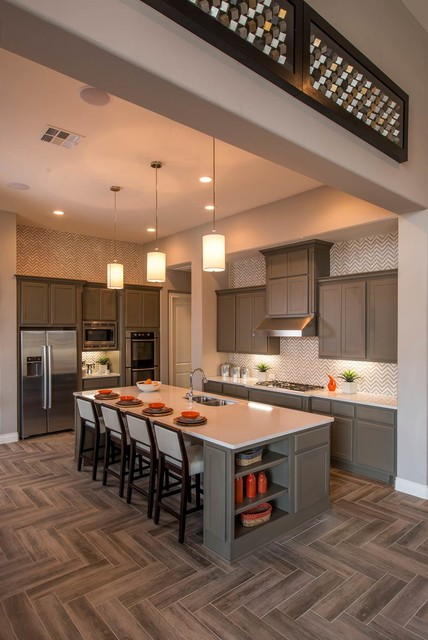 This kitchen’s accent color, blue, is accompanied by shades of gray and brown. 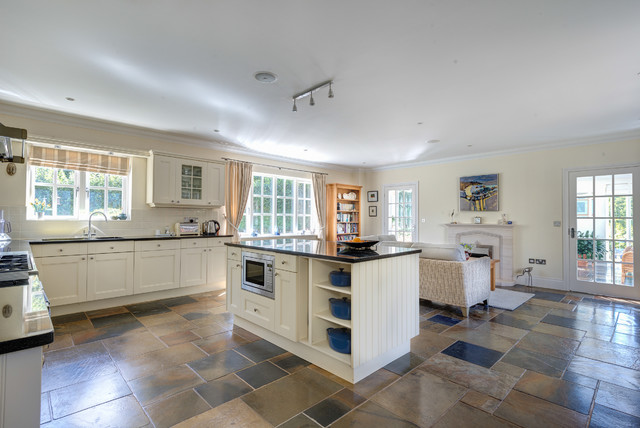 Also, note that the designers kept the rest of the kitchen understated to put the spotlight on the tiles. “What is Marmoleum?” you ask? I’ll explain. Marmoleum is a type of linoleum made by British manufacturer, Forbo-Nairn. Like most linoleum, it’s an extremely durable mix of materials like linseed oil, pine rosin, ground cork dust, wood flour, and others. Marmoleum is special because it’s created almost entirely from natural raw materials, most of which are recycled or renewable. And it’s the first floor covering to be officially certified asthma and allergy friendly. Marmoleum is also one of the most natural looking synthetic options on the market. Natural wood can be damaged by water and food spills. 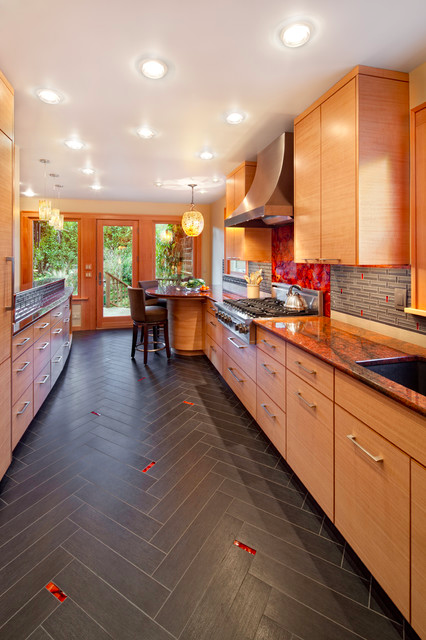 Wood-look tiles give you the same earthy flavor without the maintenance real wood requires. Plus you can experiment with fun tile patterns. The stormy gray tiles in this kitchen are from Mohawk. Is your favorite green painting hanging in the kitchen? Does your oven have bright red knobs? Match the color of your favorite kitchen accessory with small, but striking, glass accent tiles. The glass will really catch the sunlight if you have a window nearby. Switch it up by incorporating different material types. Wood panels look great next to textured tiles. 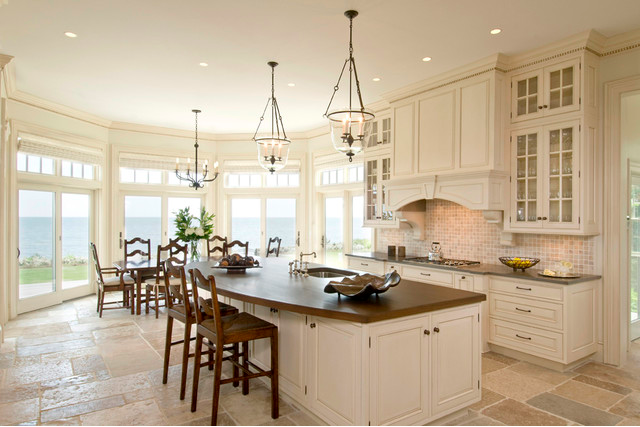 This next kitchen pairs rich wood with travertine, a soft, rough stone. (Like limestone, travertine is easily scratched, so be prepared to have it sealed regularly. Experiment with different types of stone, wood, and synthetic materials. Have fun with it! Nothing makes dark gray tiles pop like white grout. The clean lines and contrast will give your kitchen a sleek look. 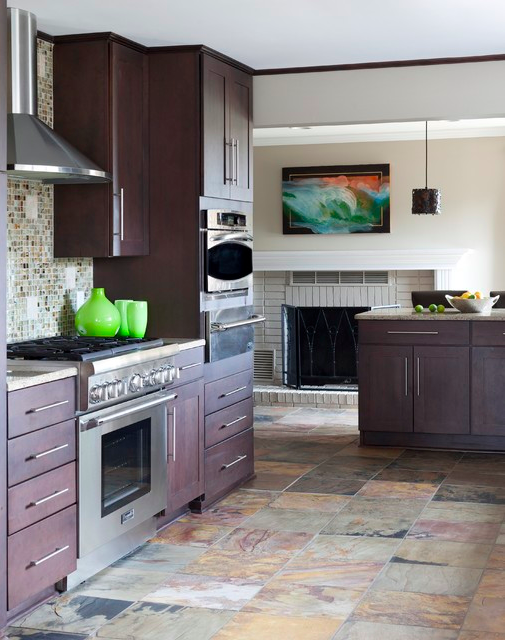 This style is especially effective in kitchens with unusual tile patterns. If you’ve got a beautiful tile layout, why not highlight it? 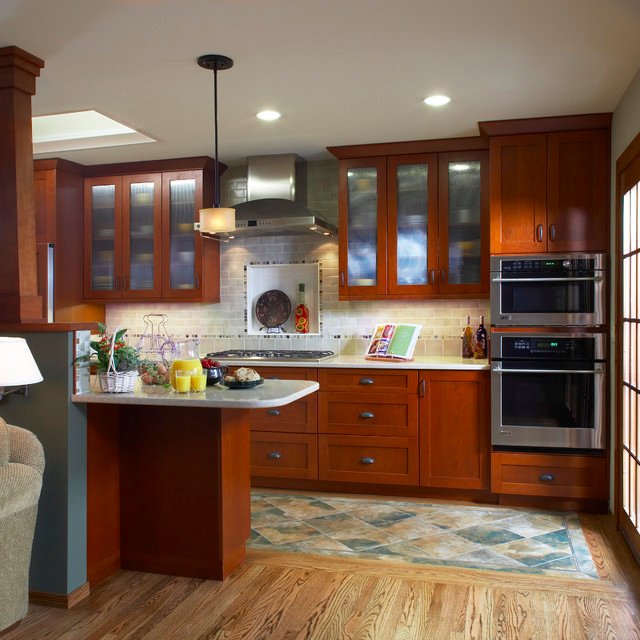 See how it worked in this traditional kitchen. I hope you’re feeling inspired. 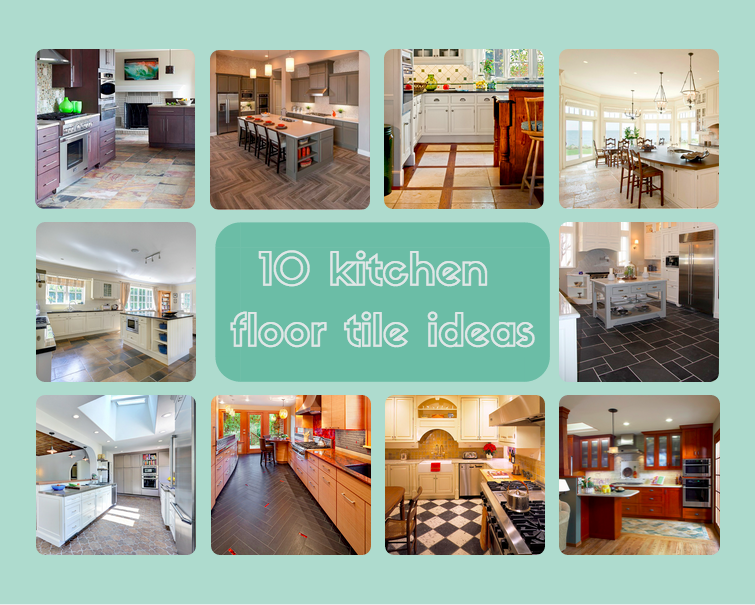 The right floor tiles can set the tone for the rest of the kitchen, or even make a bold statement themselves. Browse through our wide selection of tiles here. Here’s one more tip: If you’ve already settled on a cabinet color, bring a paint chip or swatch in that shade when you go tile shopping so you can see how they’ll look together.